The lineage of British heavy metal bands is a long and noble one, replete with legendary names like Led Zeppelin, Judas Priest, Iron Maiden, Motorhead, Black Sabbath and many more. Surely Saxon has distinguished itself well enough over the last 25 years or so to join this metallic Round Table. Though they have never sold gazillions of records, their fan base has remained solid and steady through all the varying trends of hard rock. The reason that fan base remains so steadfast is because Saxon keeps turning out albums like "Lionheart" that remain true to all the best qualities of British heavy metal. 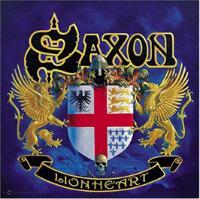 In fact, "Lionheart" is the best Saxon album since the classic "Denim and Leather" of almost 20 years ago. The years have not lain very heavily on singer Biff Byford, who seems invigorated by the strong material here. He hits some high notes I never would have thought him capable of before. As for the songs themselves, they seem to be faster and more on the epic side than most past Saxon material. It's reminiscent of the "Crusader" album, but with more speed, power and flashy soloing from Paul Quinn and Doug Scarratt. It's no mistake that the lyrics here focus so heavily on English history; with subjects like King Richard, the Battle of Trafalgar and Witchfinder Matthew Hopkins all getting a look in. It's because Saxon see themselves as troubadours of the modern age, strumming electric guitar instead of lute and carrying on tradition through heavy metal instead of folk music. It's a perfect analogy for this doughty band of metal knights. 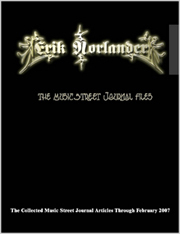 This review is available in book format (hardcover and paperback) in Music Street Journal: 2004 Year Book Volume 2 at lulu.com/strangesound. Fast and very dark, this is a tune that is full of old school British metal thunder. It's not thrash but it has a driving pace to it, and Biff's voice is a bit more nasal and threatening than usual...appropriate for a tune about the notorious Matthew Hopkins. This gets things off to a cracking start. The pace doesn't slacken much here with this chugging metal workout. The track is satisfying but pretty much by the numbers, and the melodic chorus sounds kind of awkward. This brief instrumental sounds like a medieval choir, which makes it the perfect introduction to the following track. This is the modern day successor to Saxon's classic "Crusader". It has a kind of more melodic feel that seems to summon up thoughts of knights and castles. It's a pretty quickly paced track but can't be described as head-crushing metal. It shows a mature band at the peak of its songcraft. Biff hits his highest notes ever here...really ear-piercing stuff. "Send the message/Throughout the land/The King returns/With sword in hand." Beginning with some very gentle and melancholy guitar chords, this soon jump starts into a chunky, catchy riff. This is the most unusual track on the record, a combination of ballad and tough-edged rocker. This song might be disappointing for those into Saxon's heavier, more driving moments, but I found myself warming up to it as time went on. This is a lot grittier and hard-charging than the previous tracks, but not forsaking melody. Some really powerful drumming kicks this up a notch. The clangor of sword against sword...the smack of mace on shield...the fire and blood of a medieval battle - all those images are conjured up by this excellent fast scorcher. This isn't too far off the stuff Saxon was doing in its glory days. The chorus is very stirring, and the surging mid-section might just make you feel like strapping on a broadsword yourself. This acoustic ditty is obviously in the style of old English sea chanteys, which is most fitting, as the track leads directly into "English Man O' War". Now this is Saxon at its absolute best. It's killer British flavored metal with robust riffing and screaming guitar solos. Really, this could have very easily appeared on "Wheels of Steel" or "Denim and Leather". It's right up there with Saxon classics like "747" and "Princess of the Night". A tale of tall ships at war, you can smell gunpowder and sea salt in the air...a great track! This has a slower, more mysterious feel in the vein of "Lionheart" but is still pretty heavy with a chugging feel to it. Again, the band's affinity for a catchy, memorable chorus is displayed, this time coupled with a melancholy touch. "We're still searching for Atlantis/We're all looking for our Shangri-La." This ends the record on a totally classic note, with a real crunching ditty not far off from the classic "Wheels of Steel" track. It's the story of the band's perilous flight through stormy skies to a gig in Germany, accompanied by killer mid-tempo riffing. Great stuff, classic British metal, and I love the way the pace picks up towards the end, with Biff yelling "we gotta make the show" while cowbell is getting hammered in the background. You can't get more old-school than that!